There is something about a creamy citrus sauce with pasta that may be very addictive. Add fresh tarragon, with its anise aroma and licorice flavor and your Creamy Pasta with Citrus and Tarragon becomes delicately delicious. The mind works in mysterious ways, don’t you think? When I inhale the aroma of tarragon, my mind always wonders home, home as it Holland. Tarragon reminds me of licorice, a popular candy in the Netherlands, called ‘drop’. A candy that comes in many varieties, from sweet to salt, hard and soft, all colors and shapes. I never ate a lot of licorice, but I did, do, like it. My parents raised us, their kids, as healthy as they could and that did not include a lot of candy. Licorice is and was the one I liked the most and when I see tarragon, anise, fennel, I already experience the aroma and it always reminds me of home. The reverse also works, that a certain sound, aroma, picture, experience, taste reminds you of something bad, something negative and the usual, logical response the body/mind will throw at you is rejection in whatever form. Our mind even goes as far as, if perceive something as negative, it is likely that your first experience will be reserved or you will even reject it. A simple experience I had the other day. One of the young people who work with us at www.gourmet-food.com has relatively little experience with international cheese, so we agreed that I would give her some cheese to taste when the opportunity arises. Over Christmas I gave her some Brie cheese to enjoy and when I asked her whether she enjoyed it, she said “yes, it was nice, my father liked it a lot”. A week or so ago I offered some Blue Stilton and her response was, “nah no thank you”. She never tried it, never even touched any blue cheese, but the idea of eating molded cheese, made her reject the offer. I am her total opposite; I love to try out things and one of the reasons I started by online gourmet food business, is the hope that people are willing to try new things, expand their horizon; challenge the taste buds – life can be so pretty and delicious. 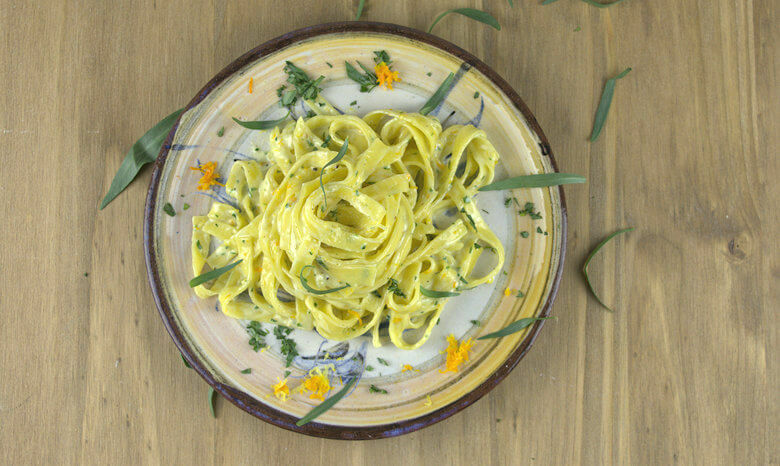 This Creamy Pasta with Citrus and Tarragon recipe is a easy and fast to make, especially when you use fresh pasta. The combination of cream and citrus is something I tried before and absolutely love it, the addition of tarragon is new. 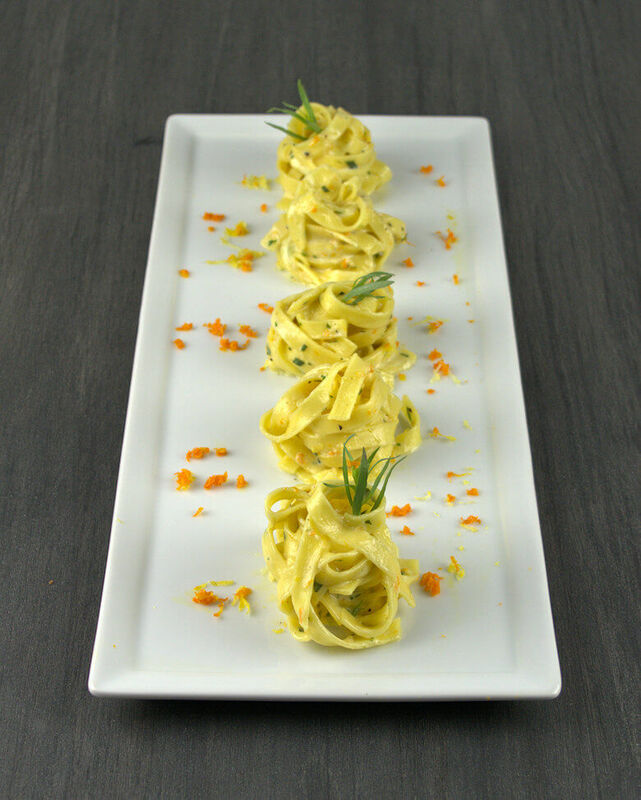 Check out the Straccetti Pasta with Lemon Cream and the Tagliatelle with Prosciutto and Orange Cream, both cream-citrus sauces. It sounds like a small thing and agreed, the addition of a herb is not ground breaking, but tarragon has a rather powerful flavor and aroma and does change the flavor of the entire dish. The combination is indeed something to try; it creates a delicate flavor. 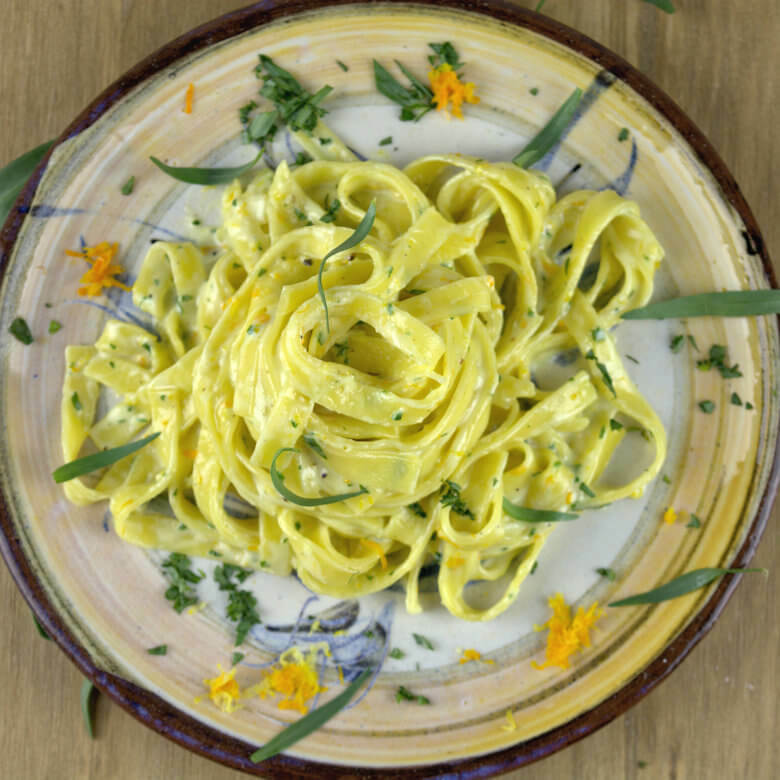 This is how the Creamy Pasta with Citrus and Tarragon recipe comes together. Combine cream and lemon and orange zest in a skillet and cook over medium heat. Stir frequently, until the sauce lightly coats the back of the spoon and sides of the pan.This will only take max. 5 minutes after boiling. Add the chopped tarragon and salt and pepper to taste. You want to hold some of the zest and the tarragon leaves for decoration. Cook the pasta according to the directions on the packaging. Drain pasta and transfer to the cream sauce, mix to coat and add some grated Parmigiano Reggiano cheese, and salt and pepper if needed. Sprinkle with some zest and chopped tarragon or tarragon leaves and serve immediately. This recipe does not include a lot of sauce, so the pasta cools off very quickly. You can serve it on a plate or try to make a little pasta tower. 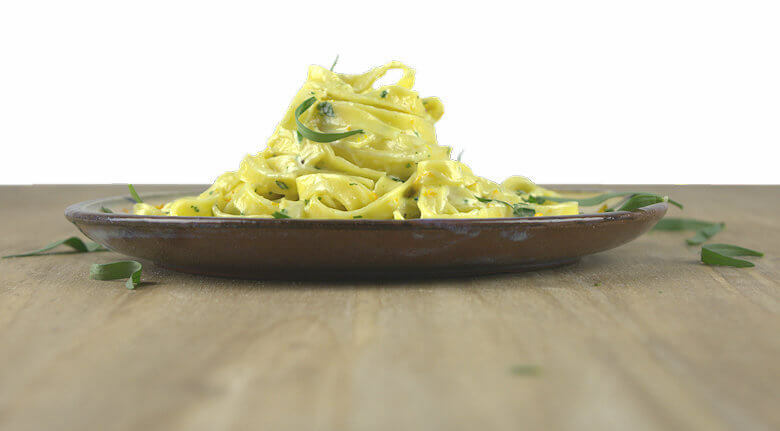 The tower is easier with spaghetti than with tagliatelle, but with this Creamy Pasta with Citrus and Tarragon it can be done. Combine cream and lemon and orange zest in a skillet and cook over medium heat. Stir frequently, until the sauce lightly coats the back of the spoon and sides of the pan.This will only take max. 5 minutes after boiling. Keep a little bit of the zest for decoration. Add the chopped tarragon and salt and pepper to taste. Keep some tarrgon leaves for decoration. Drain pasta and transfer to the cream sauce, mix to coat and add the cheese, and salt and pepper if needed. Serve immediately and sprinkle with some zest and chopped tarragon or tarragon leaves.